Regiment/Catrawd: 3rd Motor Battery, Machine Gun Corps. Service Rank and Number / Rheng gwasanaeth a rhif: Gunner No. 200. Military Cemetery/Memorial / Fynwent milwrol: Hazebrouck Communal Cemetery. Ref No Grave or Memorial / Rhif cyfeirnod bedd: Plot: 11. Row: C. Geave: 6. Died of Wounds on Thursday 13 May 1915 aged 27 years. James Henry Pearson was born in Leamington Spa, Warwickshire, England in 1888. The 1901 Census shows that the family lived at 48 Wellington Road, Rhyl, Flintshire, North Wales. The head of the family was Isabella Pearson (nee Atkinson), a widow aged 46, who was a Lodging House Keeper. She has six children – Eleanor Pearson aged 17, a Shop Assistant, Emma J Pearson aged 15, James Henry Pearson aged 13, Annie J Pearson aged 11, Thomas Pearson aged 9, and Alfred Pearson aged 3 years. Also living with the family was Isabella’s mother, Eleanor Atkinson aged 68. By 1911 James had married Lily Eileen and they lived at 15 Balmoral Grove, Rhyl, Flintshire. James was by now employed as an Art Printer. They had one daughter – Nellie Isabel Mary Pearson, who was 2 months old. 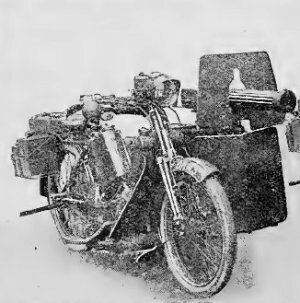 James enlisted at the Recruitment Centre, Rhyl with the Machine Gun Corps and following training entered France on 15 February 1915 and fought on one of the motor cycles shown below. He died of wounds some three months later. The Rhyl Journal – Saturday 22 May 1915 – Another Rhyl Hero. Last Saturday morning many Rhyl people learnt with deep regret of the death on the battlefield of another young Rhyl soldier, the hero this time being Gunner James H Pearson of Oakland, Wellington Road, Rhyl. At the time of the outbreak of the war he was employed in the printing trade. His country’s call immediately engaged his attention, and being a skillful motorist and ‘well up’ in motor mechanism, he first offered his services as a dispatch rider. Eventually he availed himself of an opportunity of joining the motor machine gun section of the Royal Field Artillery. He proceeded to the front in February last, and quickly had is baptism of fire. Since then he had been almost continuously in the firing line, and amongst many other daring and thrilling ventures in which he participated was the memorable onslaught on Hill 60. His letters from the front, quite a number of which we had the pleasure of receiving and publishing, and which were perused with much interest by many people, afforded numerous glimpses of the dangers he so courageously faced, and at the same time revealed the strong sense of duty he felt in going to the front. Only last week we published two letters from him, one of which stated that he and his comrades had been shelled out of what were thought to be quite safe billets by long distance German guns. The news of Gunner Pearson’s fate was conveyed to his wife in a letter written on Thursday of last week by the Rev. M. Buchanan, Chaplin of No. 5 Casualty Clearing Station, who stated that he had died in hospital the previous day (May 12th) from shock caused by burns resulting from the explosion of a German petrol shell, which seriously burnt his face and hands. The writer added that everything possible had been done for the wounded soldier by doctors and nurses, but the shock was too great for him. His last thoughts were of his wife and children. He was buried in the cemetery at Hazebrouck, Northern France, and his grave was marked by a cross. Gunner Pearson was one of twenty young men on the Christ Church Roll of Honour (which also contains the name of his brother-in-law, I J Walters, of HMS Ajax), and was the first of the number to fall. He had been a member of Christ Church for some years. He rendered willing and cheerful service there in various capacities, and was one of the most faithful members of the choir. Aged only 27 years, he was much respected in the town, and very popular in various circles. Much sympathy goes out to his wife and two little children, the younger of whom was born since to went to the war, and to his widowed mother and other members of the family. At Christ Church on Sunday morning, Mr T Harding Roberts (one of the deacons), speaking in the absence of the Pastor, the Rev Edward Jones, referred in touching terms to the death of Gunner Pearson, who he said, was one of the church’s most faithful and promising members. As a member of the choir he often led in the singing of ‘Fight the good fight’ and ‘Onward Christian Soldiers’. Now he had gallantly sacrificed his life in the noblest of causes, the maintenance of right against might, and they thanked God for the splendid example he had left behind. A resolution was passed conveying the church’s sympathy to the bereaved relatives. At the evening service the anthem ‘What are these’ and the hymn ‘ The Radiant Morn’ were sung in memory of the deceased soldier. A Pastor’s Tribute. The Reverend Edward Jones M.A. B.D. 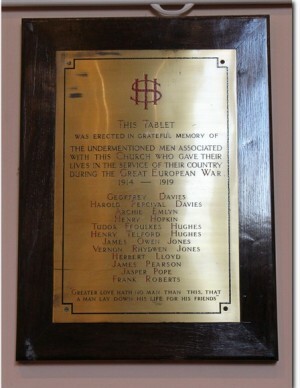 Pastor of Christ Church, Rhyl, writes – It is with very mixed feelings that one takes up the task of writing a few lines of genuine appreciation of the life and character of our young friend James Pearson, another victim of the war. One is filled with a sense of irreparable personal loss, while grateful at the recollection of a character marked by great moral lucidity and deep natural piety, and yet sorrowing most of all that we shall see his frank, honest countenance, and enjoy his guileless companionship no more. Had the subject of this brief memorial lived in happier times, we know not what qualities he would have unfolded in later years. As it is, we shall remember him as a young man of exceptional worth, guileless nature, gentle in disposition, and utterly free from conceit, vulgarity, and all the worst vices of the time. A more innocent soul never breathed, as harmless as a dove, yet he felt irresistibly constrained by a sense of duty to put his hand to the task to which he could never put his heart. Being of a quite disposition, he was reluctant to undertake any office that involved a measure of publicity, and yet we heard him read papers at our literary meetings which displayed intellectual abilities of no mean order. Very beautiful was his love of home and his attachment to his young family. In the sweet privacy of the home he lived with that gentleness and faithfulness that makes parting exceedingly hard. The tendency to depreciate home life, which seems to be a growing feature of our age, found no support in his example, and for the brief span allowed him he proved himself above the average a dutiful son, a devoted husband and tender father. Shining through the other virtues that adorned his life there was a devout, reverent spirit, that fear of God, that awe of the unseen, that kept him from scepticism and worse in an age of religious uncertainly. That the objects of faith were realities to him is indicated in a letter from Belgium. He tells how a few days before he had a marvellous escape, and adds, ‘Only the night before our Lieutenant was talking to me about the efficiency of prayer, and how some escaped while others fell’. He was a mind not averse to such serious conversations upon the ultimate truths of life. Strong also was his attachment to the church where he was a constant, reverent worshipper. From the distant battlefield his mind turned to this house of God, for he writes in another letter,’ It is Sunday evening, and I can just fancy the quiet service in dear Christ Church – how I should like to be there now’. Scott Mobile Machine Gun Unit.